There are over 450 varieties of azalea. Proper azalea planting, along with correct site selection, are essential to the successful growth of your new azalea plant. Careful planning, as always, will assure a healthy, beautiful landscape no matter what you are planting. Rhododendrons have at least 10 stamens with scales on the underside of the leaves; azaleas have only five stamens and hairs on the leaves instead of scales. Azaleas can be deciduous or evergreen, while rhododendrons are usually only evergreen. Azaleas have funnel-shaped flowers and rhododendrons have bell-shaped flowers. When selecting the type of azalea you want for your garden, ask the people at the nursery which of the many types will grow best where you live. Choose a sturdy, well branched plant that is obviously healthy. Don't think you can revive a scrawny, sick looking plant. You'll just be wasting your money. The best site for your azaleas will receive light to moderate shade all year round. Ideally, during the blooming season your azalea should get filtered sun to prolong the flowers. Full sun tends to attract lace bugs, but full shade will cause a weak plant which will be vulnerable to disease. Avoid azalea planting under shallow-rooted trees like ash or maple. This will cause competition for moisture and nutrients that your azalea isn't likely to win. Azalea planting is best done in acidic soil with a pH of 4.5 to 6. A soil test is the best way to determine that your garden spot has the right pH. If it doesn't, soil amendments can be used to improve this. Rich, well drained soil is also necessary for azalea planting to assure the necessary nutrients are available for your plant and to protect it from root-rot. If your soil is lacking in nutrients or has high clay content, you will want to add organic matter, such as compost, to the entire garden bed. Avoid adding it just to the hole you will be planting your azalea in. This can result in water pooling in that area and root-rot is a sure result. Correct azalea planting is not difficult. In fact, azalea planting can be done at any time of the year. Spring planting is the most common because it is the best time to enjoy those beautiful flowers. However, spring planting also requires careful watering to prevent the shallow roots from drying out during the summer heat. Fall planting is a great time to plant because it gives your azalea time to acclimate to its new surrounding and get established. Unfortunately, you'll need to wait until the following spring for flowers. The choice is really yours. As long as you plant it and water it correctly, your azalea will be fine either way. If your azalea appears root-bound when you remove it from the pot, make a few cuts from the top of the soil mass to the bottom. These cuts, preferable about one quarter of an inch deep, will encourage the roots to grow out as well as allowing enough water to penetrate the root ball.If your azalea is balled-and-burlapped, the burlap can remain as long as it is pulled away from the top about six to eight inches. However, make sure that there is not wire or string around the roots and remove any plastic. Now you are ready for azalea planting. Begin by digging a hole that is a few inches deeper than the root ball and two to three times wider than the spread of the branches at maturity. This information can be found on the plant tag or you can ask where you purchase your azalea. Loosen and then firm the soil in the bottom of the hole to prevent the plant from settling and ending up lower than the soil level after planting. Now, place your azalea into the hole and fill in with dirt, tamping it around roots firmly. Water well to eliminate air pockets in the soil. A soaker hose or drip irrigation system is the most effective way to water your azalea. If drainage is a problem in your chosen location, consider building a raised bed for azalea planting. Your plants will be happier, healthier and more productive. Finally, apply a two to three inch layer of organic mulch or compost to keep soil at a moderate temperature and prevent drying out. This is also an effective way to control weeds in your garden without using chemicals. To reduce chances of disease, make sure that mulch is a few inches away from the stem of the shrub. It is best to wait for your azalea planting to be well established before applying any fertilizer. 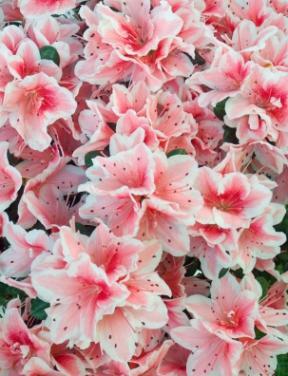 Since they have lower nutritional needs than most shrubs, you may find that the organic mulch will add enough nutrients to keep your azalea healthy. However, if you notice signs of nutrient deficiency, indicated by stunted growth, smaller or yellowing leaves or leaves dropping prematurely, you may need to add fertilizer. Your best choice is a slow-release 12-4-8 or 15-5-15 fertilizer or one that is specified for azaleas and rhododendrons applied to the root zone, which can be a six foot radius around the azalea plant.